Welcome to the official discussion thread for Pokémon Conquest on the DS! To start, please add this game to your log, add it to your collection (if applicable), and (when you are ready) rate it using the link above! 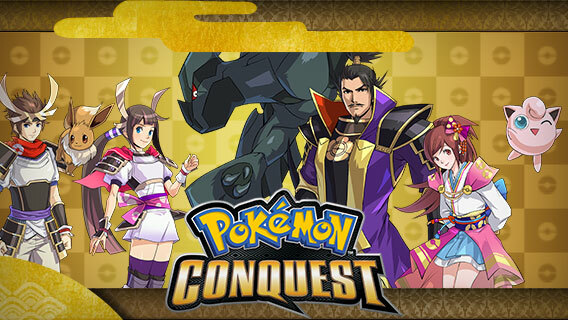 Ok, I didn't find any thread specifically on Pokemon Conquest. I bought the game, played a lot, and just finished the main story. I was kinda mad to have put so many time on my pokémons just to lose all the link % in a blank. At least, you keep the links themselves (if you had an umbreon and an arba with the hero, he will still have them) and your items I think. I'm at my first post-main-arc scenario. I also lost my 200 000g. I really like Pokémon and strategy RPG. I felt the game was a bit easy for my taste, then again maybe I did too much grinding. Is anyone farther than that in the game? What are you impressions so far? My wife and I would love to pick up this game at some point once we have some more free time! How long did it take you to finish the main story? Oh, and it would be cool if you linked to the database entry in your OP! @roykoopa64 About 25 hours, and I goofed around a lot to evolve my Eevee into an Umbreon. There seems to be a few scenarios after the main story, you can even download some. Every time I've wandered into Target I peruse their DS selection with the thought that if they have this game, I'll get it. However, they never have it. And after having the heightened interest to get this game over the weekend, I've found that no one carries it at the moment - online or off. I don't think I've seen a game like this become so scarce so fast, especially during a non-peak gaming period. It just makes me want it even more! I think I want this game? I had interest in this game and, like others, had trouble finding it. Even one of the GameStops nearby did not have it in. Seemed strange for a game with Pokemon in the title. I lucked out getting the final unopened copy at a Play-N-Trade, though. I haven't tried it out yet, but it seems up my alley. I hope to try it soon. And I wouldn't at all mind if it's on the simpler side of things. I may get this down the line if I can find a slick deal. I played a bit more into the scenarios last night. Good news is : it gets harder. The other realms don't just sit there and actually attack you. So if you don't plan your things carefully it is possible to have a hard time. For example, I decided to level a zone first instead of recruiting new Pokémon. Bad choice, bad bad choice. Now I'm stuck with two low level pokémons and a level 2 zone to recruit from. Haha!